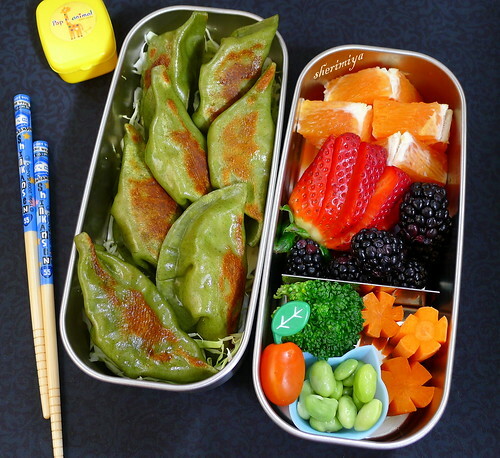 Spinach Gyoza Bento, a photo by sherimiya ♥ on Flickr. Gyoooooza! I found spinach wrappers in the grocery so I had to make gyoza. I think the green color is pretty cool-looking. I used ground turkey meat and added chopped scallions and choy mixed in to make the filling. This double stainless steel box set I got from Bento & Co comes in handy for this kind of bento. I placed as many gyoza as could fit into one box, atop a bed of shredded cabbage, and in the other box I packed the usual fruit (cara cara oranges, strawberry, blackberries, tomato) and vegetables (broccoli, carrots, and edamame). We have a glut of cara cara oranges around here; I can get a net bag of about 12 oranges for 99c. As a result, they make an appearance in daily bento, at breakfast, and in my midday smoothie. I love their ruby pink color, and they are sweet and juicy. Score! That Spinach Gyoza looks sooooo good. I wish I could have some. Hopefully they will start making Gluten Free wrappers soon. Never seen those! Maybe there is a rice version out there. I know some folks who roll out and cut their own wrappers. I know it's probably a simple recipe and method but it's so much more convenient to buy. The color of Gyoza is wonderfui! I hope the taste of spinach is really intense as the color, I love spinach anything! Yummy! Spinach, turkey and scallion sound like a light and very yummy filling for these pretty green gyozas! I'm on team cara cara, too--love em! Happy weekend to you and yours :D! The cara caras are wonderful this year, aren't they? They are great! Hope you can find them Ming. yum, love me some gyoza. these look especially healthy between the vitamin-packed wrapper and lean filling. love the skinny two-tier, too. great end of week treat... and hope you had a wonderful weekend with the family in the meantime! 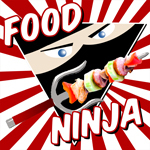 Love me some gyoza too; I mean, who can resist! these spinach gyozas look DELICIOUS!